Use our great all-in-one Outlook add-ins collection to increase your email productivity and remove the daily frustrations of using Outlook! Bells & Whistles is an Outlook add-in designed to help you increase your email productivity by enhancing the Outlook functionality. To put it simple, this productivity Outlook add-in helps you write & manage emails faster! Bells & Whistles for Outlook can greatly enhance your productivity on handling email messages. By using automated text sections to every email reply, this Outlook add-in will save the time you would normally spend on manually typing email reply introductions. Create and insert boilerplate text sections on your emails, so you don't have to type repetitive text. For example, if you are working on a support department, you can greatly increase your email productivity by making text templates with the most common answers to support questions and quickly insert the desired template in an email. Automatically add email addresses to the CC or BCC sections of outgoing emails, so you stop wasting time typing the same CC or BCC address(es). Add text notes to your Inbox emails. For example, if you want to remind yourself why a given email is important, you can easily add a text note to it: next time when you open the email, the text note will pop-up. 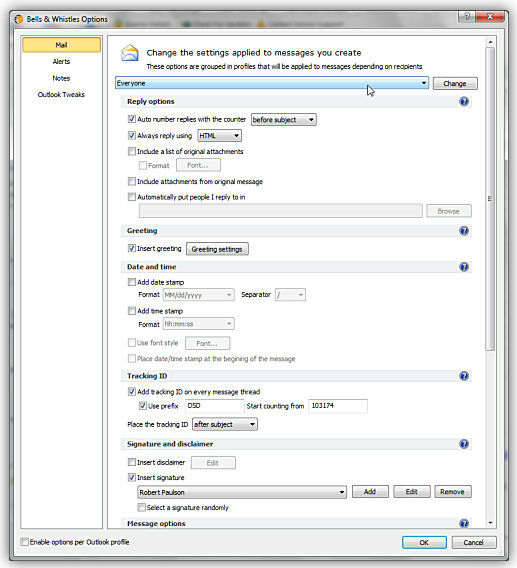 In order to increase your email productivity and avoid retyping an already sent email (in case you need to send it again), you can use the innovative "Send Again" or "Edit & Send Again" options of Bells & Whistles, available for your Outlook Sent Items folder. Bells & Whistles is an Outlook add-in fully compatible with Microsoft Office Outlook 2000, 2002, 2003, 2007, 2010 and 2013 (x32 and x64). It is designed to work on Microsoft Windows XP, Windows 2003 and Windows Vista. Read more about each major feature of the Bells & Whistles Outlook addin!